In any of these circumstances a reservation email is automatically sent to the customer. In addition to the emails automatically sent to customers, you will receive a notification email whenever a new reservation is made. This entry was posted in Booking email templates, General and tagged email notification, Webreserv email confirmation, When is a notification sent. 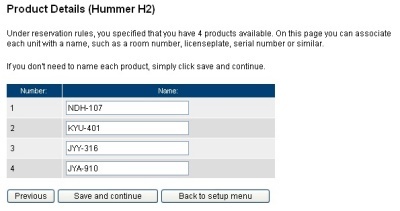 With the latest WebReserv release, it is now possible to name your products/rooms/units individually. This allows you to manage and track reservations and utilization at a completely new level. For example, you can track now only what your customer reserves, but you can track exactly what unit is rented out and returned. To name your products, go to setup -> products and reservation rules -> product details. In the list you can name each product. Typical names are room numbers (for hotels), tag numbers (car and RV rentals), serial numbers (equipment) and so forth. When a reservation is made, you can quickly see which unit(s) that has been assigned, and if needed you can reassign the units as needed. This entry was posted in General, New Features and tagged product detail, product name, webreserv new feature. Imagine having a system that automatically process credit card payments when a reservation is made. There is no need to spend precious time calling the customer to ask for credit card information and there is no need to manually process credit card payments. WebReserv can do all that – and much more. First and foremost there is the automated credit card processing feature. Whenever a new reservation is made, WebReserv can automatically process the credit card as part of the reservation. If the credit card is not valid, or the transaction cannot be completed for any other reason, the reservation is refused. Virtually all common credit cards can be accepted, including MasterCard, Visa, American Express, Discover and many more. You can decide which cards you will accept and which ones you don’t want to accept. In addition to the automated processing during the reservation process, you can use the ePay Virtual Terminal to process additional credit card transactions, such as payment for additional items or services. The virtual terminal can also be used to process refunds. WebReserv automatically groups all payments and refunds related to the same reservation code, so it’s easy to keep track of payment activities related to the same customer and reservation. You can see the transactions in the integrated transaction history. For more information about payment processing, click here. This entry was posted in General, Payment Systems and tagged credit card payments, webreserv payment processing. WebReserv.com has partnered with National Merchant Alliance to provide simple and secure web based credit card payments to WebReserv.com users. WebReserv.com’s partnership with NMA will provide the opportunity for you to utilize this service at rates equal to or lower than your existing processor relationship. National Merchant Alliance, (NMA) provides secure, IP Based electronic payment solutions through a partner network of technology and financial services providers. Through a software integration agreement with WebReserv.com, NMA provides WebReserv.com users access to a Payment Card Industry Certified (PCI) online payment software service (gateway). While these products work largely behind the scenes of the WebReserv.com application, it is important for users to note the level of security and reliability of the products performing this very important function. In addition to eliminating double entry of data and simplifying the reconciliation process when using WebReserv.com, this integration program ensures users that their sensitive customer data and the associated revenue are handled in a manner exceeding industry requirements. It is very easy to start utilizing WebReserv.com’s integrated solution. The first step involves determining the savings offered by National Merchant Alliance’s processing pricing or determining the pricing match. Depending on your market and your volume, the merchant account pricing may vary, but it will never be higher than what you are currently paying (if applicable). Please note that e-commerce transactions for all markets are inherently higher than retail rates, regardless of processor. For many of the markets served by WebReserv.com, pricing may start below 2% in certain circumstances for WebReserv.com transactions. In all cases, the pricing offered will be clear and without hidden charges or fees. Send (fax) in your previous processing statements (1 to 3 months) to 800-707-4095 or to 913-906-9595 for a custom electronic payment analysis. NMA will perform a confidential written analysis for your records and pledges to meet or beat your current pricing. Schedule a quick phone application with your NMA rep (usually takes 5-8 minutes) and NMA will fax a pre-filled merchant application with a pricing and fee schedule for authorized signature. NMA will also include a user agreement for the integrated software. Fax the paperwork to (800)-707-4095. You will be approved and ready to process through your software in maximum of 3-5 business days. This entry was posted in General, Payment Systems and tagged booking system credit card payments, national merchant alliance, recieve credit card payment, webreserv credit card payments. “Getting Started with WebReserv.com” is now available for download from WebReserv.com. The guide shows how easy it is to get started with WebReserv.com and provides a high-level description of the functionality. Welcome to the official WebReserv.com blog. We will be using this blog to share news about WebReserv.com, describe new features, talk about upcoming events and much more. The blog is also intended for you to share feedback about WebReserv.com, suggest new features and functionality and so forth.